The Cogent DataHub’s Bridging feature lets you connect between servers, so that a change in one piece of equipment can be communicated directly to another. With a few clicks of the mouse you can link OPC servers with each other, or bridge other data sources into a single cohesive group. Bridging also provides an easy way to scale or modify the value of a data point as it passes through the Cogent DataHub. Unlike other bridging products, the Cogent DataHub bridging interface is multi-threaded. This means that when you have bridges configured to multiple OPC servers, then a slow or non-responsive server will not slow down the performance of the bridges connected to the other servers. You can connect OPC Servers on the same computer or over a network connection (bridging and tunnelling at the same time, as shown in the image above). Read more about OPC Bridging. 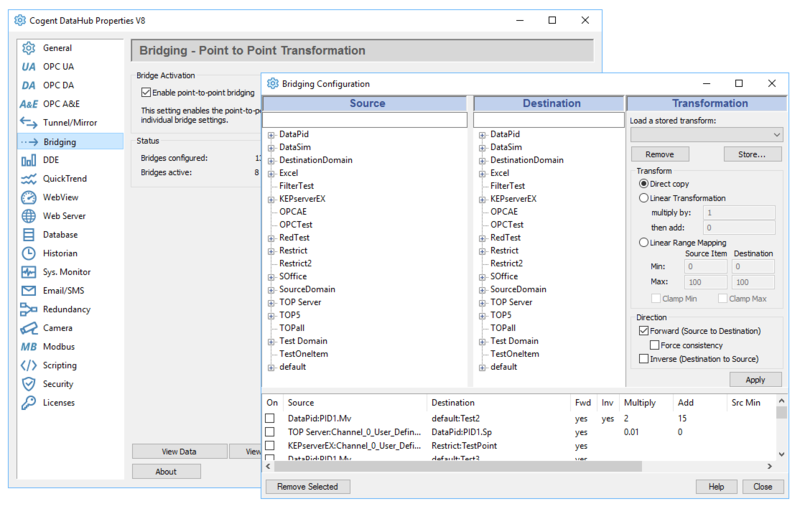 The Bridging feature can be added to any license pack.